What Chris Rock’s Oscars 2016 Monologue Should Have Said! via Oscars 2016: Watch Host Chris Rock’s Monologue. We want opportunity – give African American CHILDREN the same opportunities as Caucasian & Asian American CHILDREN. That’s it. — What Chris Rock should have said to AFRICAN AMERICAN WOMEN at the Oscars. via Third Grade Student Not Allowed to Return to School Because He’s Black. I agree with Ms. White, we need to begin viewing each other as Americans, each of us working toward ending the human ignorance and belief that our complexions define the type of individuals we are. Though I’d prefer Ms. White “challenge” city policy instead of “fighting” it. The words we use can define the type of person we are. Ms. Basset was born about the same time Mr. Berry Gordy introduced the beautiful, loving sounds of Motown music to our world. Ms. Basset grew up listening to virtually all American musicians of African descent writing and performing music admiring, praising, wooing, lamenting, loving and respecting WOMEN. Sadly, today and for more than thirty years little girls grow up listening to a significant number of popular American music performers characterizing her, her mom, sisters, grandmas, aunts and nieces as a less than human ^itches, or ^hores unworthy of respect. via Florida officers refuse to work security at upcoming Beyoncé concert | theGrio. Hi, Nick. 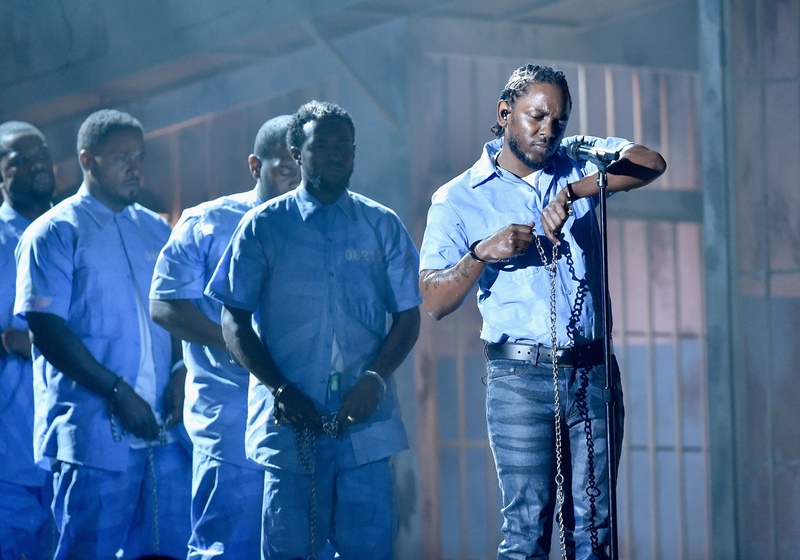 I’m trying to like Kendrick though he is making it difficult by continuing to hate-on the police while IGNORING THE FACT that he was raised in a Violent Felon embracing family and community environment that far too often threatened the lives and emotional well being of peaceful Compton residents as well as police. Nick, I recognize some cops cross the line, sometimes taking out their anger and frustrations on citizens they believe are responsible for contributing to the mayhem and harm caused to peaceful residents. I recognize some cops do not have the skills and temperament required to regularly deal with witnessing grade school children and teens being subjected to Childhood Trauma while slowly being conditioned to embrace the Street Culture that deprived Kendrick and the children in his immediate and extended families from enjoying a safe, fairly happy “Average Joe” childhood. I recognize that after twelve years of witnessing and dealing with human pain suffered by far too many innocent people emotionally and/or physically injured (or worse) by teens and adults raised by single moms who in my opinion were criminally negligent in raising their newborns, infants, toddlers, children and teens…I recognized concerns for my own deteriorating emotionally well being, my attitude, as well as concerns for my physical safety told me it was time to pack up and leave the madness behind me while I still had some compassion and empathy left in my soul. Nick, I’ve met young Tupac, the kid with the hungry belly snatching neighbor’s purses to feed his belly. I’ve met young Kendrick, the kid raised in a violent felon embracing family and community environment. From a young age I was schooled and conditioned to embrace empathy for others, I was scolded or punished when my caregivers learned I did not use it. Witnessing kids like Kendrick and Tupac being conditioned from a very young age to embrace, under duress, a lifestyle that causes them to experience stress, anxiety, fear, uncertainty…I understand why Tupac rapped about depression and suicide, same for Kendrick. Nick, after watching the way a significant population of Brooklyn, NY moms raised their children I understand why many teens and adults rap about women being less than human ^itches and ^hores unworthy of respect. Frankly, if I was raised by a mom who showed little concern for my well being, offered me very little GENUINE love, caring and affection, and as I matured realizing my mom selfishly birthed me to gain a .gov handout, which resulted with me being a ‘welfare kid’ (unlike most Average Joe and Josie American kids) experiencing a childhood of pain and hardships…I can’t say my mind would not be just as messed up as Kendrick’s, Tupac’s, Freddie Gray’s or Michael Singleton’s minds. Nick, after learning little six-year-old Kendrick Lamar was forced through no fault of his own to endure a horrifically stressful and traumatic childhood, I understand why he is an angry, frustrated, depressed man. I cannot imagine what it is like to be a little kid neglected and emotionally abandon by an uncaring mom, as Kendrick relates in paragraph ten of this LAWeekly interview. Nick, there is no moral or legal justification for police ignoring their sworn duty and abusing or unjustifiably harming citizens. Just as there is no moral justification for parental caregivers introducing newborns, infants, toddlers, children and teens to a young life of struggle and hardships while telling their kids it’s everyone else’s fault they are poor. Am I peeved and disappointed with moms who selfishly introduce children to a horrible childhood filled with needless drama and emotional trauma…you bet! However, taking into account America’s history of human ignorance/greed, atrocities and abuse suffered by innocent people abducted and enslaved in a foreign land, I understand why some of my African American neighbors are peeved, depressed and understandably took advantage (human nature) of flawed social programs that opened the door to Tupac (born 1971) and Shawn Jay Z Carter (born 1969) becoming victims of Child Abuse and Neglect, aka Poverty. Again, I employ the empathy I was schooled to embrace under duress of scolding or punishment if I failed to, instead focusing my anger and disappointment on American leaders like Hillary Rodham Clinton and America’s Premier Presidential and Parental First Couple. What do you think of my troll, Nick? via A Black Police Officer’s Fight Against the N.Y.P.D. – The New York Times. Here, Officer Raymond addresses The REAL CRIMES committed by grossly immature maternal caregivers who irresponsibly introduce children to a childhood of pain & struggle all while WILLFULLY IGNORING their parental responsibility to their children, as well as their moral, ethical and societal obligation & duty to their neighbors and community to place the emotional well being of their children ABOVE ALL ELSE!! I am glad a young Edwin Raymond was strong enough to resist becoming entrenched in Community Violence, though I am sad he is NOT FOCUSED on changing laws that would protect kids from being exposed to Childhood Trauma by Criminal or Criminally Negligent Parenting that creates Community Violence. via Hillary Clinton and African American ‘Super Predators’ – YouTube. First she characterizes as “Super Predators” children who were exposed to Childhood Trauma, Abuse and Neglect that often causes many kids to mature into depressed, angry, frustrated, unpredictable, sometimes suicidal (NY Times May 18, 2015 – Rise in Suicide by Black Children Surprises Researchers) teens and adults lacking empathy, compassion and respect for their peaceful neighbors. Instead Mrs. Hillary Clinton wants to speak about “healing” those already emotionally scarred by Childhood Trauma while completely IGNORING actions society should take to PREVENT children from being raised and nurtured by apathetic “living wild” (Kendrick Lamar’s characterization of his parent’s ‘people and community’ harming lifestyle) parental figures who selfishly introduce children to a childhood of hardships and pain. Isn’t it bad enough Mrs. Clinton chooses to ignore the plight of our Nation’s most valuable and precious resources being raised and nurtured by CRIMINALLY NEGLIGENT primary caregivers! But then for Mrs. Hillary Clinton to characterize these VICTIMS of an abusive and neglectful childhood as “SUPER PREDATORS” when she knows WHY many depressed, angry teens and adults lack empathy, compassion and respect for themselves, their neighbors and the authority responsible for maintaining peace…well, this is the primary reason I have absolutely no respect for this duplicitous, disingenuous American citizen or her throngs of supporters who do not question her duplicity. In my opinion, the real and actual SUPER PREDATOR is Mrs. Hillary Clinton who for the SOLE purpose of gaining votes WILLFULLY ENABLES a substantial population of African American teen and adult moms to continue causing great emotional harm to our nation’s young during a critical period of their childhood development. Apparently Mrs. Clinton has no problem being a ^itch or ^hore who exploits for personal gain, American people touched by and suffering from what Dr. Robert K. Ross believes is America’s most profound and debilitating disease in today’s society…CHILDHOOD TRAUMA.